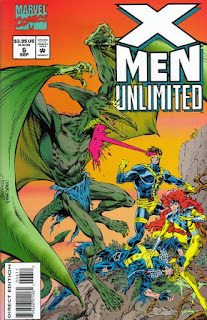 As Sauron struggles to find a source of energy to keep him sated, Worm & Whiteout bring a captive Havok into the Savage Land, closely pursued by Cyclops, Phoenix & Polaris. 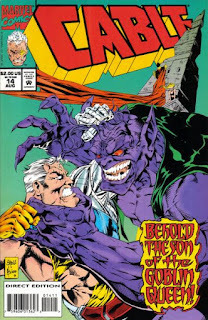 After meeting with Nereel and learning Sauron's attacks have become increasingly vicious, the three mutants infiltrate his citadel in pursuit of Havok, but end up captured. Sauron proceeds to drain the energy of both Cyclops & Havok, but Polaris & Phoenix manage to escape and damage the machine regulating the power transfer. In the confusion, they flee the citadel but are attacked by a super-charged Sauron. 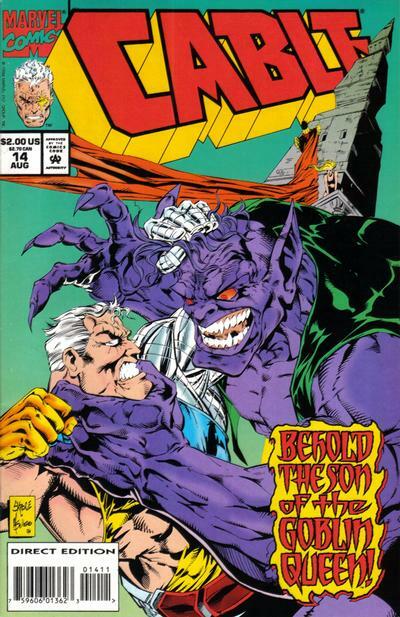 Phoenix proceeds to enter Sauron's mind and discovers the lingering presence of Karl Lykos, who, with Phoenix' help, battles the mental representation of Sauron. Ultimately, he launches himself & Sauron over a cliff, killing them both, and leaving Sauron with nothing but his animal instincts. 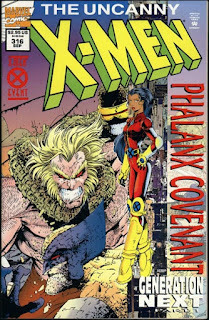 Next month, "The Phalanx Covenant" concludes, two more villain-centric '94 annuals come out, and we get to spend Thanksgiving with all the assorted preview material Marvel pushed out ahead of the launch of Generation X! Artoo helps the Rebels escape Gamandar as Darth Vader targets Admiral Tower for endangering Luke. 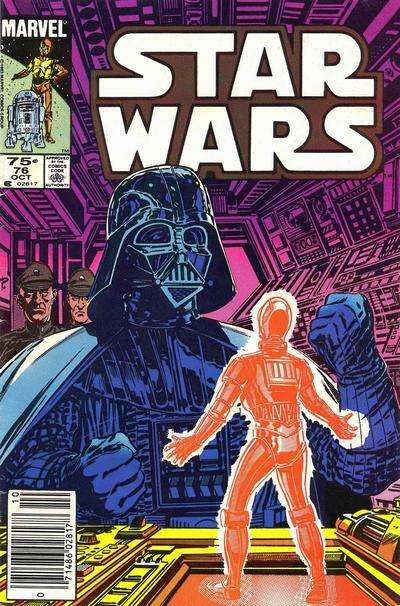 Darth Vader meets with his officers aboard the Executor to discuss the situation on Iskalon, but is enraged when he's contacted by K-3PX and learns Luke Skywalker was on the planet when Admiral Tower ordered the attack on Pavilion. On Iskalon, as Luke, Leia & Kiro tend to the dead, Kendle appears, having declared herself the head of the school and falsely blaming the Rebels & Kiro for the destruction. 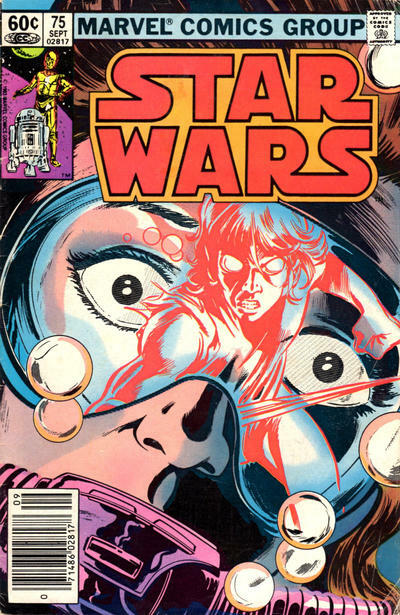 On Gamandar, Admiral Tower interrogates Mone & the captive Rebels, during which Mone learns Kendle betrayed them. Tower is interrupted when he is arrested on Vader's orders & dragged away. This gives Artoo an opening to free the Rebels, and they escape aboard the Falcon as Vader orders Tower's execution & prepares to go to Iskalon to search for Luke. On Iskalon, Luke, Leia & Kiro are outnumbered when the Falcon arrives. Kendle is killed in the ensuing conflict, and Mone mourns both her death & her betrayal. He then declares that from now on the school will reside in the depths of Iskalon, shunning contact with airbreathers as long as the Empire remains. At Excalibur's old lighthouse, Britanic tells Meggan about his journey through the timestream. 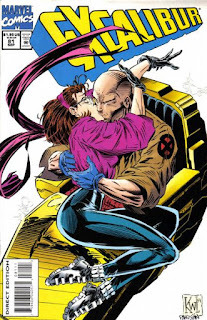 Meanwhile, Kitty takes Douglock to a tavern in Aberdeen, hoping to determine how much of Doug Ramsey is in him, while Professor X takes Moira to Paris to give them both a much needed break. At the lighthouse, Meggan asks Britanic if he can tell her their future, but Britanic explains that all of human existence is such a small fraction of time, it's impossible for him to narrow down his perceptions to just their lives. Meggan reminds him of the recent changes she's experienced as well, and both confirm their love in the face of such changes. In Aberdeen, after Kitty stops a mugging, Douglock admits to being lonely, and Kitty offers him a place with Excalibur so they can figure out how much of Doug he is together. In Paris, Xavier & Moira reminisce about their past relationship, and take comfort in the fact that no matter what, there will always be a place in their hearts where they're still in love. "Book Two Life Signs - Part Two The Faith Dancers"
Cannonball, Wolfsbane, Forge & Xavier discover the Phalanx plans to eradicate all life in the galaxy. Forge, Cannonball & Wolfsbane are delivered to a seemingly-idyllic town in the Italian Alps by Douglock, but the town is comprised entirely of Phalanx. 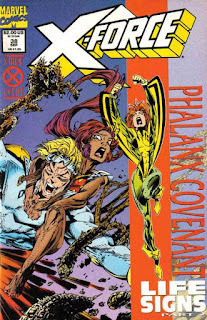 In France, Moira examines everyone who had previous contact with the techno-organic virus in the hopes of finding a way to stop the Phalanx, while Xavier uses the Astral Plane to telepathically locate Forge and the others. 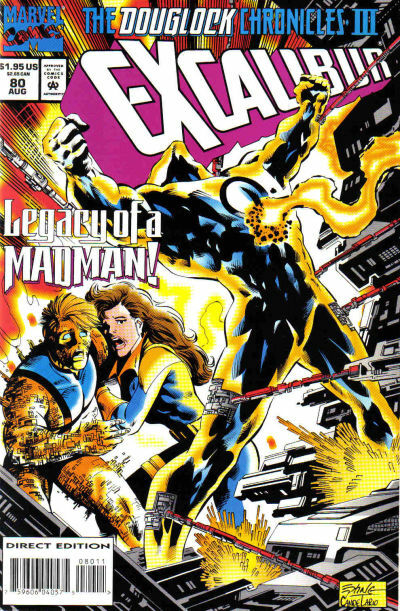 After Douglock infects Forge with the TO virus so he can more fully understand the Phalanx, Xavier merges with Forge's mind, and they are able to see the Phalanx for what they are, including their intention to destroy all organic life in the universe. 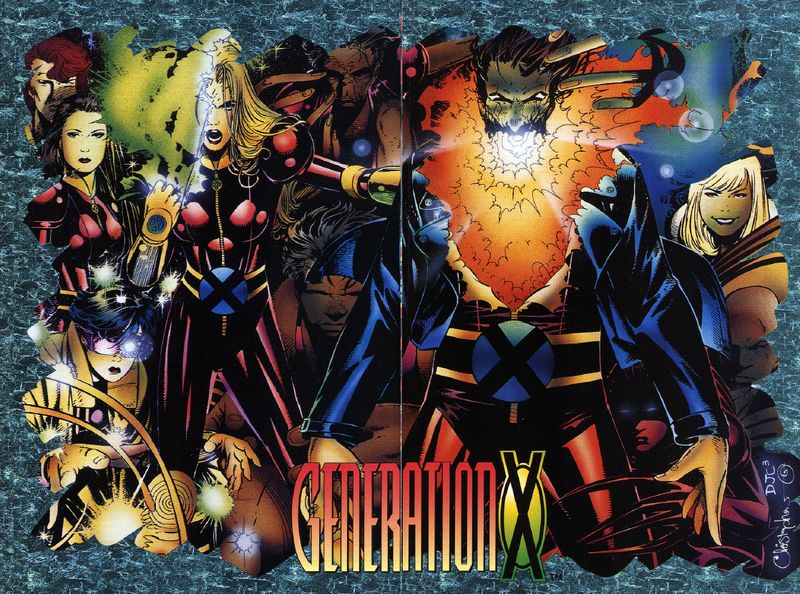 Returning to his body in France, Xavier tells the assembled mutants the Phalanx must be stopped before they can summon more of their kind, and the group is split, with half staying behind to protect Moira as she continues her efforts, while the other half will go to the Alps to assist Forge and the others. Meanwhile, Douglock is forced to infect Cannonball & Wolfsbane in order to allow the group to penetrate deeper into Phalanx territory. Once they do, as they're unknowingly watched by Shinar, they discover the Babel Spire, a massive communications device with which the earthbound Phalanx will summon their alien brethren with the news that Earth is ready for assimilation. "Drop the Leash: Book One - Generation Next Part Two"
The Banshee's team rescues Everett Thomas from the Phalanx, but Paige Guthrie is captured. The Phalanx continue their efforts to find a way to assimilate mutants, experimenting on the captive Monet, while Lang muses that the group is evolving beyond his expectations. 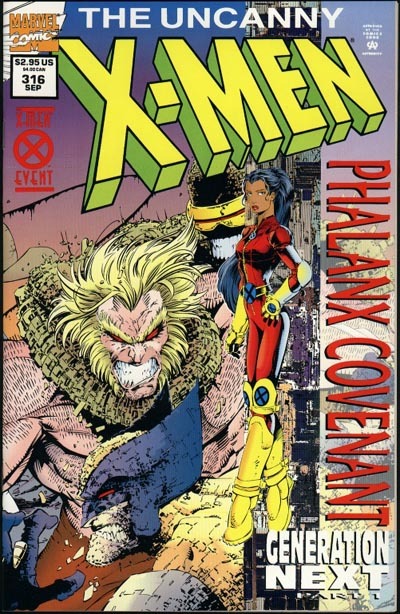 Meanwhile, in St. Louis, Banshee, Emma Frost, Sabretooth & Jubilee rescue Everett Thomas from the Phalanx, but in Kentucky, the Phalanx manage to abduct Paige Guthrie. Back in St. Louis, the Phalanx attack the X-Men, but Emma is able to help Everett use his power to sync Jubilee's power and trigger a massive explosion. Just then, Lang appears and taunts them with an assimilated Sara Grey and the captive Paige. Emma cautions him that in trying to save humanity, he may be dooming it, and when Lang disappears, she reveals that she was able to at least make telepathic contact with Paige and knows the general location where she is being held. Just then, Jubilee points out that Sabretooth has gone missing, and Banshee realizes Sabretooth has escaped. 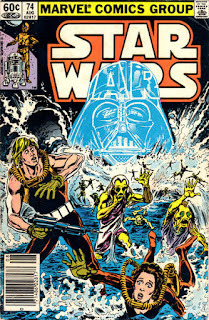 A revived Kendle seemingly leads Luke & Leia out of the underwater wreckage of Pavilion, but she abandons them when confronted by Kiro, a fellow native of Iskalon. Elsewhere, Lando, Chewbacca, Mone & the droids arrive on Gamandar. As Artoo goes off on his own, Lando, posing as a war profiteer by the name of Drebble, leads the rest of the group to a meeting with Admiral Tower. Though Tower plays along, unbeknowst to the Rebels, he is well aware of who they really are, thanks to a spy on Iskalon. Later, under the cover of looking for droids to resell at profit, Lando and the rebels seemingly discover Tay Vanis' former droid, K-3PX. 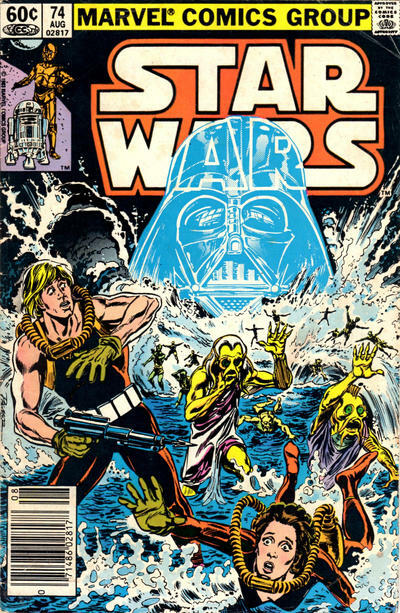 Back on Iskalon, Kiro leads Luke & Leia to the surface, where he reveals that Kendle betrayed them to the Empire - he overheard her contacting Admiral Tower. 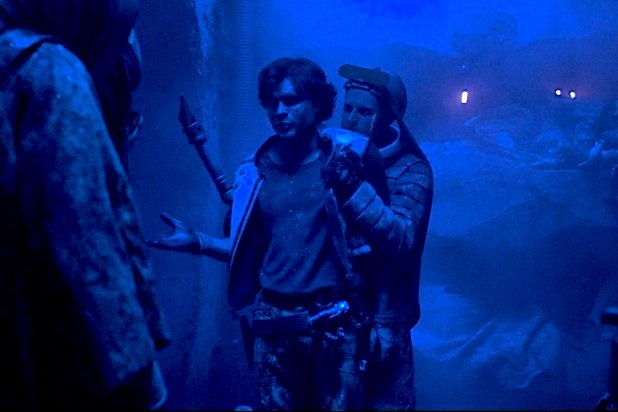 Luke realizes what this means for their friends on Gamandar who, sure enough, are now imprisoned in an Imperial cell. 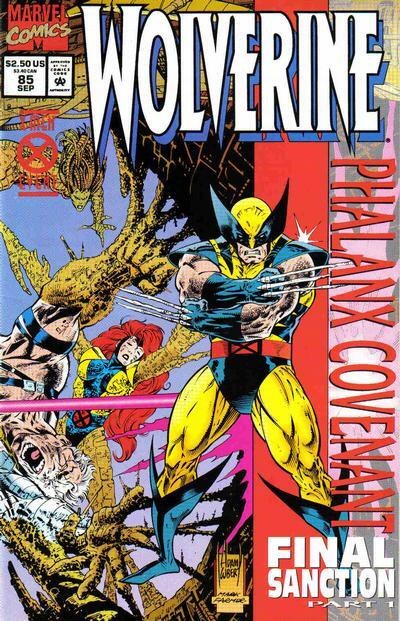 "The Phalanx Covenant Final Sanction Part One"
Wolverine, Cyclops, Phoenix & Cable reunite to battle the Phalanx. 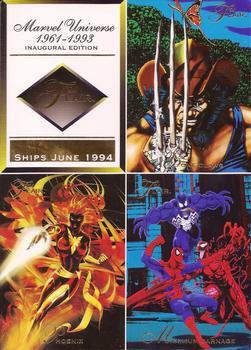 Cyclops & Phoenix arrive on Muir Island to find it overrun by Phalanx trying to access the genetic information stored in the computer systems. Their plane is attacked & sent crashing to the ground, but the timely arrival of Wolverine allows the three to retreat to a different part of the island. After checking in with Lang, the Phalanx track down the three X-Men, but just then, Cable arrives and helps push them back. 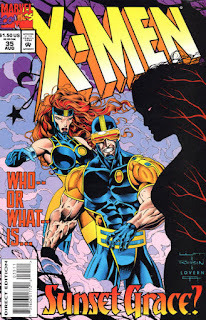 The foursome formulate a plan in which Phoenix & Cable will telepathically disguise them while Cyclops & Wolverine infiltrate Moira's lab and retrieve a Cerebro component they can use to locate the captive X-Men. 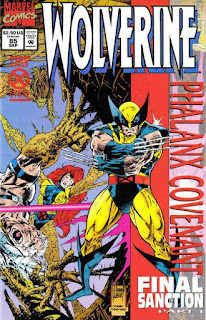 But when on the Astral Plane, Cable's proximity to Jean trigger memories of his childhood, which breaks their connection & attracts the attention of the Phalanx. Cyclops & Wolverine retrieve the component & prime the lab to explode, and Cable tells them he'll stay behind to cover everyone else's escape. But Wolverine goes back for Cable, and Phoenix manages to telekinetically protect them when the lab explodes. Picked up by Wolverine's pilot friend Harry, Wolverine tells him to make for Tibet, where the Phalanx are holding the X-Men captive. 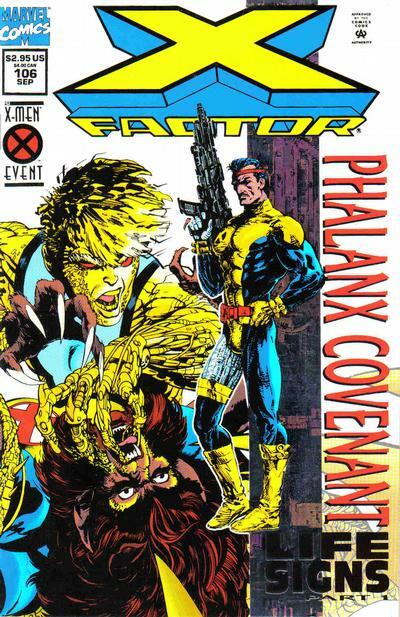 "The Phalanx Covenant Life Signs Part 1"
X-Factor arrives at the former monastery base of the Acolytes, called there by Professor X. 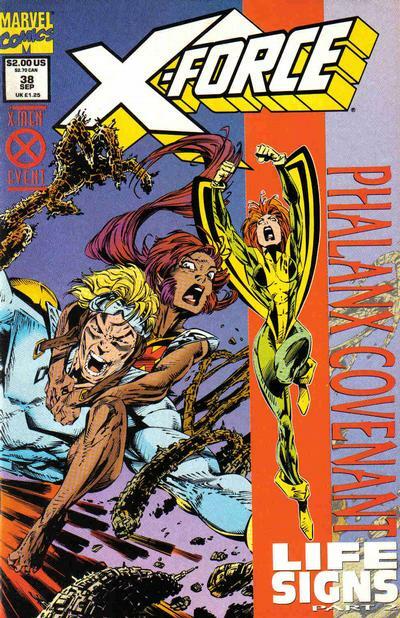 They find X-Force & Excalibur waiting for them, and Xavier explains how the Phalanx infiltrated Muir Island, prompting Excalibur's flight to the monastery. During the briefing, Cannonball notices that Wolfsbane has gone missing, and he follows her deeper into the monastery, where Douglock is being sequestered. Elsewhere, Stephen Lang grapples with the sudden influx of rebelliousness within the Phalanx hive mind, including the canine-esque Shinar who is making his way through the European countryside. 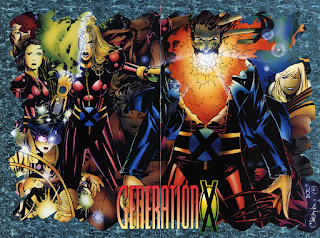 Back at the monastery, Wolfsbane & Cannonball are are soon joined by Xavier & Forge, who is overwhelmed when his perception of Douglock mixes with Xavier's telepathy. He asks Xavier to leave, and Douglock proceeds to tell them the history of the Phalanx, including their biological imperative to eliminate organic life inherited from Warlock's DNA. 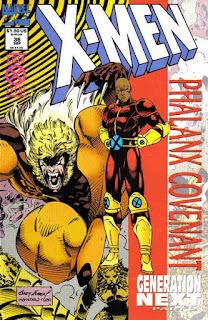 He then tells Forge he needs his help to learn more about the Phalanx, then fights his way past Nightcrawler, Polaris & Shadowcat to escape the monastery with a captive Forge, Wolfsbane & Cannonball in tow. The group then disappears, and Xavier declares he can't locate them. "Generation Next Part One: Encounter"
In Monaco, the mute Monet St. Croix & her guardian are attacked by the Phalanx. 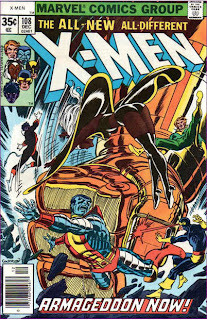 Meanwhile, Banshee returns to the mansion after a trip to Massachusetts to find the X-Men acting strangely: Archangel acts accusatory after Banshee takes a call from Scott & Jean, Psylocke fails to sense him telepathically, and Gambit & Bishop don't bat an eye when he tests them by saying that Professor X is walking again. Fearing the worst, he checks on Sabretooth, and when Rogue tries to stop him, he attacks, revealing her to be one of the Phalanx. 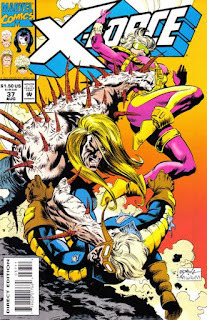 Releasing Sabretooth, Banshee tasks him with freeing Jubilee & the White Queen while he sees to exterminating the Phalanx. But when he discovers the Phalanx have breached the X-Men's computer and are planning on capturing the next generation of young mutants, he sets the system to explode, then rendezvous with Sabretooth, White Queen & Jubilee in the tunnels under the mansion, telling them they need to find the young mutants before the Phalanx do!